Yesterday at work, I did a double shift…yuck 😦 But because I was training, it freed me up some time to do some baking which I never really get to do on my regular shift. I was rummaging through the fridge and freezer when I found some extra fruit that was ordered for an event that has already finished. 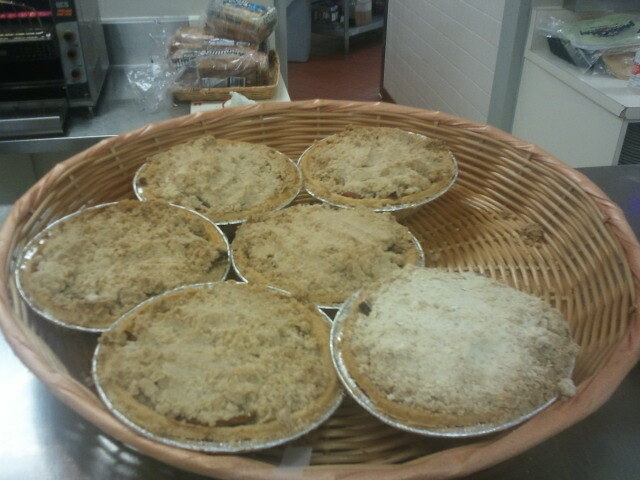 So, I decided to make these yummy looking pies for the people that come through for lunch/dinner. Did they ever turn out awesome 😀 Here’s my recipe! 1 large pie shell, preferably the deep dish ones because it can hold more filling! Start a pot of boiling water. Score an “x” into the bottom of each of the nectarines. Once the water is boiling, drop the nectarines into the water. Start a bowl of ice water. Boil the nectarines for 5-7 minutes then take out and place into ice water. This makes it much easier to peel the nectarines. Cut the fruit into good size wedges so they will hold up during the cooking process. Mix with spices, honey and brown sugar. Set aside. Mix the honey in with the butter. Put all the dry ingredients and spices into the bowl. Drizzle the melted butter into the dry mixture. Be careful, the butter is hot. Gingerly, mix the butter into the dry mixture until pieces are pea-sized. Put the filling into the baked pie shell and top with crumble mixture. Bake at 375F for 15 minutes or until the crumble is brown. This recipe works great with the splenda brown sugar blend. I use that a lot at Christmas for my diabetic friends and family. Just note that you will need less than what it calls for by almost half. So please adjust accordingly. You can also add some frozen blueberries to the mix as well. Any fruit that holds up well in bake would do for this recipe.